Movie ad with depiction of gun on bus shelter just outside branch library in L.A.'s Highland Park community. On this past Wednesday, the Los Angeles City Council adopted a resolution declaring June 18 as “Gun Violence Prevention Day” in the city. The unanimous vote followed speeches by six councilmembers decrying the havoc caused by firearms and their easy access, especially for the city’s youth. Nobody mentioned the fact that guns and acts of violence are regularly on display in our outdoor spaces in the form of ads for movies and TV shows, often in ways that could be considered glamorizing violence by depicting the use those guns as empowering and exciting. The real and implied mayhem can be seen on billboards, supergraphic signs, and in the public-right-of-way on bus shelters and kiosks. At Wednesday’s meeting, Councilmember Jose Huizar spoke of how kids as young as 12 years old can easily get guns. Councilman Ed Reyes spoke about mothers being worried about their children getting home from school without being victimized by gun violence. 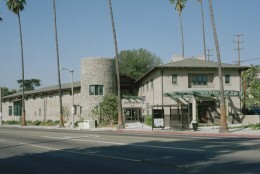 Arroyo Seco Branch Library on North Figueora St. in L.A.
Late last year a bus shelter directly outside the entrance to the Arroyo Seco Branch Library displayed an ad for the movie, “The Mechanic”, which consisted of a depiction of a large handgun formed from graphic representations of many guns, rifles, knives, and grenades. Because the city gets revenue from those bus shelter ads, Reyes and Huizar and others might want to consider how many children who could become victims of gun violence, and how many who might be perpetrators of gun violence, gazed upon that ad. Last year, a movie ad with an actor brandishing a gun appeared outside Venice High School, just feet away from the spot where a student was shot and killed in the aftermath of a fight. After complaints were made to Councilmember Bill Rosendahl’s office, CBS/Decaux removed the ads. 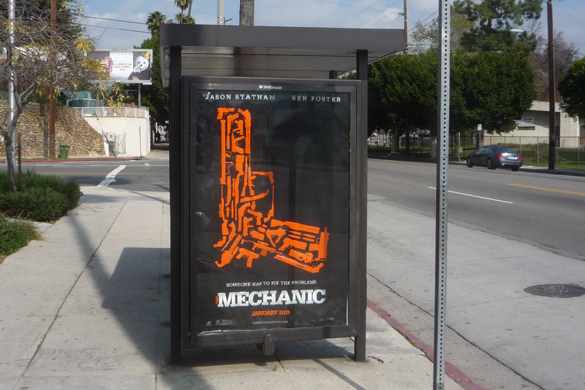 However, this year the ad for “The Mechanic” appeared on another bus shelter just outside the high school. These kind of ads appear on private property as well, on billboards that sometimes draw complaints from community residents. 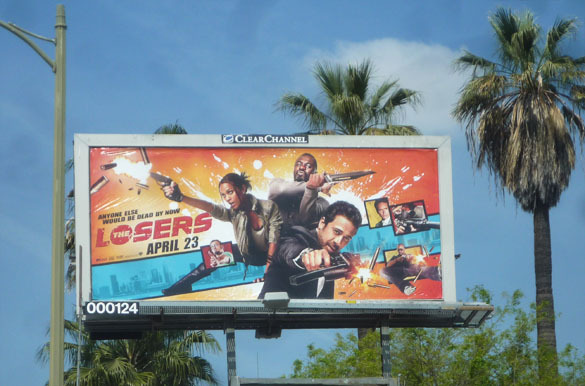 This ad for the Warner Bros. movie, "The Losers" was displayed on Clear Channel billboard directly across street from L.A.'s Belmont High School. Four actors are shown firing guns, a fifth wielding a knife.